Know what is in demand, where. Since 1996 we are experts for POS and event marketing. Our special focus lies in FMCG and automotive. In the past years we have been active for several global leaders. Always having emphasised in trusting, long-term relationships with our customers, often resulted in positive developments on both sides. Our partners have helped us to be able to offer a huge service portfolio today which contains the entire palette of measures and solutions to make your brand visible and your products available. Continuity, reliability, precision, creativity and the strive to constantly improve and be even more efficient make us a great partner for the long run. Transparency and the use of state of the art IT gives you security and the control over the entire execution process of our projects. 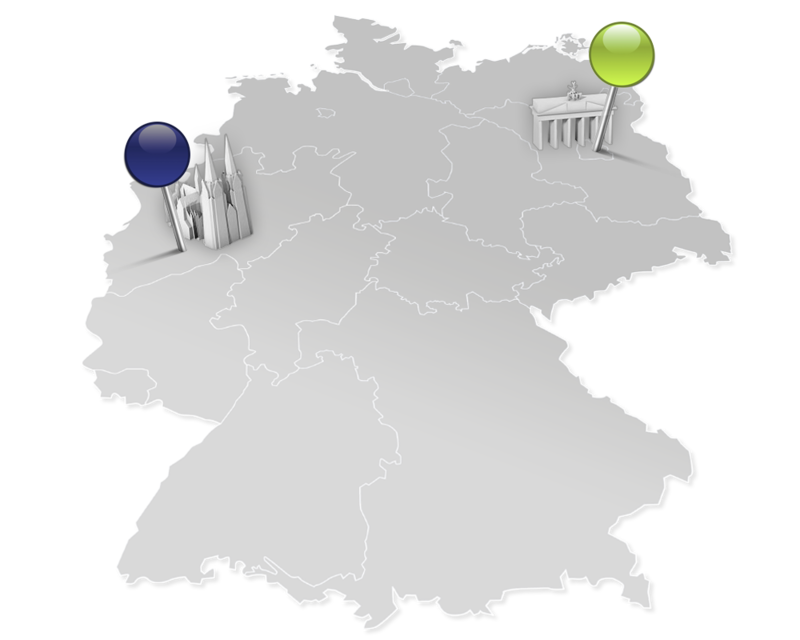 We work from two thriving metropolitan German cities Berlin and Cologne. These special places inspire us every day. But our teams are there for our customers all over Europe. Being a clearly structured owner-managed company, the hierarchies are flat which allows quick and decisive decision making. Our competencies can be used across sectors. Our aspiration: customised concepts for every customer, every brand and every occasion. You’ll never walk alone. Information, promotion, emotion and motivation – only the entire package makes live communication effective. Win the customer at the POS with staged themes and messages, sophisticated appearances and well-designed brand identity. Our clients’ often large range of products, services and offerings we see as our ongoing challenge to achieve maximum success at reasonable costs. We are able to transfer our range of services to different lines of business. Having knowledge of the product and always keeping in mind our client’s corporate identity, mindset and boundary conditions, all our communication strategies are tailor made. Here is as excerpt of our customers who feel confident in our accomplishments and quality. Some of which we have been working with for more than 20 years. Our accomplishments as a team are only as good as the individual players. Being a modern company there are many ways of working together: permanent position, freelancing, short- or long-time. Two things are most important to us: fairness and team work. Together we can achieve greatness. Our work spectrum is as diverse as our colleagues, our customers and their products. We are looking for smart and motivated individuals who are committed and whose strong service orientated communication skills are strengths that can be applied in your daily work – internally in the agency as well as externally. Are you eager to play an active part and enjoy your job in Marketing? You have come to the right place! We are looking forward to meeting new team players! Currently we have no vacancies for permanent positions. We are looking for… YOU! Fill in the application form now and send it to this email address.